Can You Imagine Anyone Taping and Tying Up a Dog Like This! A man who pleaded guilty of causing suffering to a dog is going to spend the next two years of his life behind bars. After that he will be on probation for the next three years. The dog, bound by electrical tape around its snout, paws and neck and then abandoned, was found by a good Samaritan who fortunately was able to rescue him just in time. Here’s the full story as reported by I Heart Dogs. 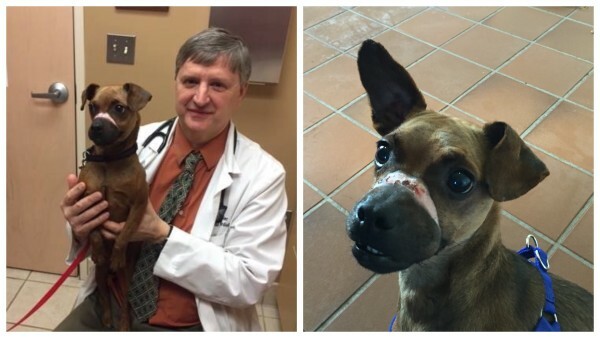 A man was walking his dogs in Windsor, Ontario when he stumbled upon a terrible scene: a small brown dog with his muzzle and limbs tightly bound with electrical tape, lying helplessly along the side of the road. Thankfully the man, named Dean Cresswell, found him just in time. The pup is a thirteen-pound Patterdale Terrier named Nos, about six years of age. When the story was picked up by news stations and it was discovered that Jessica Hems and Adam Esipu were his owners, the public quickly turned on the couple for responsibility in the animal cruelty case. Hems and Esipu had just had a baby, who turned out to be allergic to Nos. Claiming to be too heartbroken to bring the pup to the shelter themselves, they enlisted the help of Michael Earl Hill to take him to the Windsor-Essex County Humane Society, supplying him with the $60 surrender fee. Hill did not bring Nos to the humane society, but instead, left the dog bound and abandoned, to die. 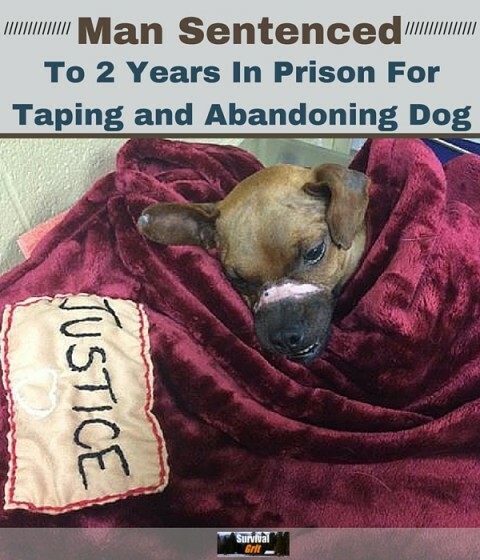 On Monday (February 1st), Hill plead guilty to “causing unnecessary suffering to an animal.” His sentence includes two years in federal prison followed by three years probation, and he cannot own any pets for 25 years. He has been denied bail, and since his arrest on December 18th, he has been held in solitary confinement. The terrier has since been dubbed Justice because of the public’s demands for him to get justice from this terrible case of abuse, along with so many other innocent animals like him. “We at the Humane Society are grateful that the Crown and Judge took Justice’s case so seriously and imposed a sentence higher than is often given in animal cruelty cases,” the Windsor/Essex County Humane Society posted on their Facebook page. Meanwhile, Justice is being cared for at the Windsor/Essex County Humane Society. They said he’d been found in the nick of time, as he was having an increasingly difficult time breathing do to the swelling of his muzzle caused by the tape. If he’d been found just a few hours later, this miraculous story would have ended in tragedy. Currently, Justice has undergone three surgeries to remove damaged tissue around his muzzle, and is receiving treatment for heartworm. Additionally, this wonderful organization is working with him on his behavior following the traumatic incident, so he will better assimilate into his new forever home. “Applications to adopt Justice are not being accepted at this time as our focus is on getting him well,” reads Justice’s Story on the Windsor/Essex County Humane Society website. However, if you would like to donate to help fund the pooch’s medical costs, click here. While this is a heart-wrenching story, the public’s demand for Justice’s justice is so important. Hopefully, abusers will receive severe punishments in the near future, causing others to think twice before hurting an innocent animal.